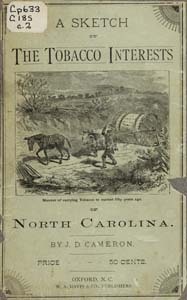 J. D. Cameron (John Donald), 1820-1897 A Sketch of the Tobacco Interests in North Carolina. Being an Account of the Culture, Handling and Manufacture of the Staple; Together with Some Information Respecting the Principal Farmers, Manufacturing Establishments and Warehouses; With Statistics Exhibiting the Growth of Tobacco in the Western Counties, and Also in the Other Tobacco Producing Regions of the State, as Shown by Comparison of the Crop of 1880 with Those of Preceding Years. A Sketch of the Tobacco Interests in North Carolina. Being an Account of the Culture, Handling and Manufacture of the Staple; Together with Some Information Respecting the Principal Farmers, Manufacturing Establishments and Warehouses; With Statistics Exhibiting the Growth of Tobacco in the Western Counties, and Also in the Other Tobacco Producing Regions of the State, as Shown by Comparison of the Crop of 1880 with Those of Preceding Years. Oxford, N.C.: W. A. Davis; Baltimore: Press of Isaac Friedenwald, 1881. Tobacco -- Storage -- North Carolina. Tobacco curing -- North Carolina. Tobacco farms -- North Carolina.